Ocean rowing offers the romanticism of life on the open wave freedom from the modern world and ample time to think, but at a price – the incredible strain of physical and mental endurance and the risk of being lost at sea forever. It is both a physical and psychological challenge with rowers having to journey over vast distances and endure long periods alone at sea. As such it is not a popular sport, but it has been growing in popularity recently, with some describing the feat as ‘the new Everest’. Several hundred people have rowed across the oceans of the globe to date, with the majority of these taking place on the waters of the Atlantic. The history of ocean rowing is generally divided into two categories – the historic ocean rows before technological advancement and the modern day rows. Needless to say, ocean rowing is not a casual weekend activity but a life-consuming and life-risking adventure. For this reason it is usually falls into the extreme sport category. The most famous ocean rowing race, the Atlantic Rowing Race, has a whole new level of frisson because it is not simply a question who will win the race, or even finish it, but which of the competitors will survive. According to the Ocean Rowing Society the death rate for people attempting to cross an ocean in a rowboat is about one in nine. Although it’s easy to imagine challengers rowing across vast oceans in a creaky wooden rowboat like one might find at a local park, modern ocean faring rowing vessels are in fact far more sophisticated. They are typically lightweight, self-righting, shaped to move easily through turbulent waters and capacious enough to shelter two people and hold several months of provisions. Ocean rowing already has a healthy share of risks and does not need anymore. Ocean rowers should therefore reduce any chances of running into misadventure by ensuring their craft is seaworthy, making sure to check and maintain systems even whilst at sea, and also by having a sound understanding of both the boat and the ocean. They should also maximise safety by ensuring they have all the necessary safety equipment. The essential equipment list includes such items as a fire extinguisher, life jackets, an extensive first aid kit (including anti-seasickness medication), flares and radar. The dynamic nature of the oceans means that it is necessary to allow the prevailing winds and currents dictate the course of the journey. For example an east to west traverse of the North Atlantic must be completed in the lower latitudes so as to take advantage of the trade winds (patterns of winds around the equator) and currents, with a return trip taking the northern latitudes. This explains why the Atlantic Rowing Race, begins in the Canary Islands at the base of the trade wind belt and ends in the West Indies. Not only is the route of the ocean row critical to a successful and safe voyage but the time of year it is embarked upon is also vital, so as to avoid local stormy and hurricane seasons. The ideal time depends entirely on where the trip is being undertaken. The traditional aforementioned Canary Islands to Caribbean voyage, for example, would be best attempted between November and April. Season voyage planning becomes more complicated when a trip spans many degrees of latitude. 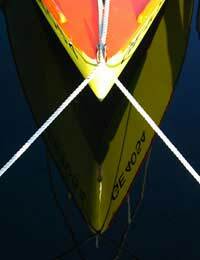 Timing a row from Portugal to Costa Rica, for example, is particularly important because leaving in fair summer conditions might mean arriving in stormy contrary weather. Unfortunately such careful predictive planning can mean nothing with the unpredictable effects of global warming, which has led to some extreme atypical seasonal conditions. It is therefore vital to keep an eye out for any pre-voyage weather trend anomalies. Nevertheless voyagers should all travel with pilot book and pilot charts, which compile weather data and provide information on average wind directions and speeds, ocean currents etc.